Use code HCTB$4 during checkout or click here. Use code HCTB$3 during checkout or click here. Use code HCTB$2 during checkout or click here. 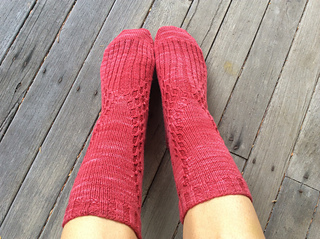 This cuff-down sock features a symmetric pattern of slowly but steadily increasing cables, travelling in order to come together just below the ankle, and rapidly disappearing into as much ribbing as you enjoy. 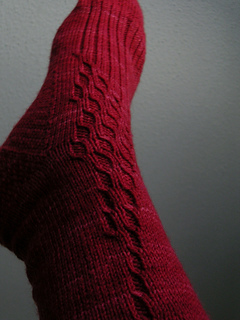 This pattern isn’t as much a full sock pattern but more like a cable chart that happened to be designed for use on a sock. 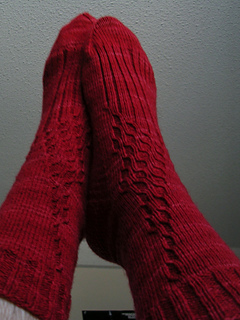 The pattern outlines how to include the cables as part of a typical cuff-down sock base, and is written for knitters who are already comfortable with sock knitting and working cables from charts.